This bicycle (named after the Spanish nature reserve), was developed in response to customers who appreciated the versatility of the Coto Doñana Tour, but wanted a slightly lighter bike since they didn’t plan to do loaded touring. This bike is designed around a lighter tubeset and a narrower tire. The gearing is the same as the Coto Doñana Tour since Shimano no longer makes road triple cranksets and many riders feel the compact gearing still isn’t as low as they’d like it to be. The bike can accommodate tires from 1″ to 1-1/4″ wide. 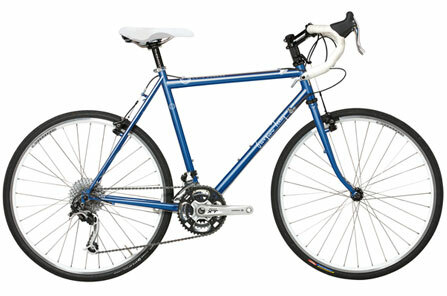 The steel frame and fork are designed for a spirited but supple ride. Frame and fork made by Waterford Cycles in Wisconsin. Wheels manufactured by Velocity USA in Michigan. Schwalbe Durano 28-559 (XS, S, M, L); 28-622 (XL); Note: Compass Elk Pass Extralight 32-559 (XS, S, M, L) or Compass Stampede Pass Extralight 32-622 (XL) available for a $52 upcharge. derailleur cable guides under bottom bracket, chainstay derailleur cable guide. You can choose from a palette of frame colors. Or you can design your own! XS, S, M and L have 26″ wheels, XL has 700c wheels.